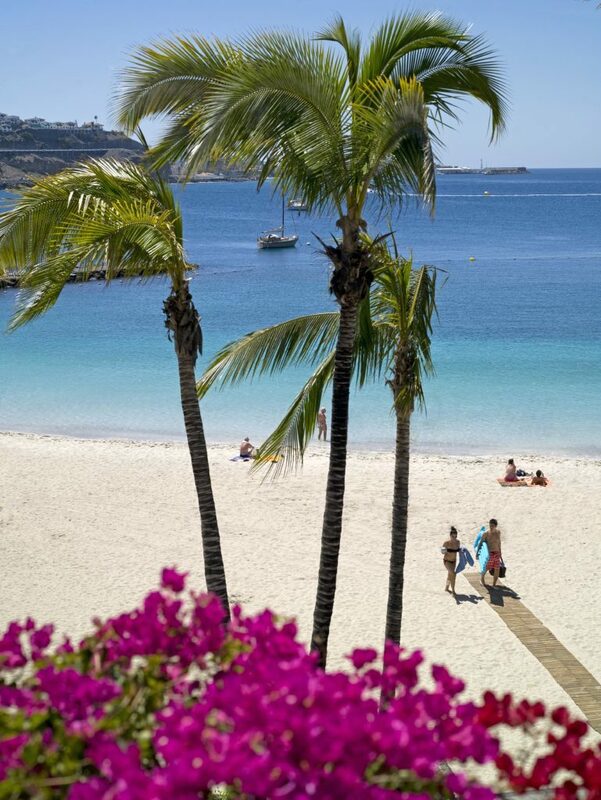 Sunshine isn’t the only reason to travel to Gran Canaria, but it is a very good one. After all, research carried out by a leading New York climatologist concluded that the capital city of Las Palmas enjoys the best climate in the world. 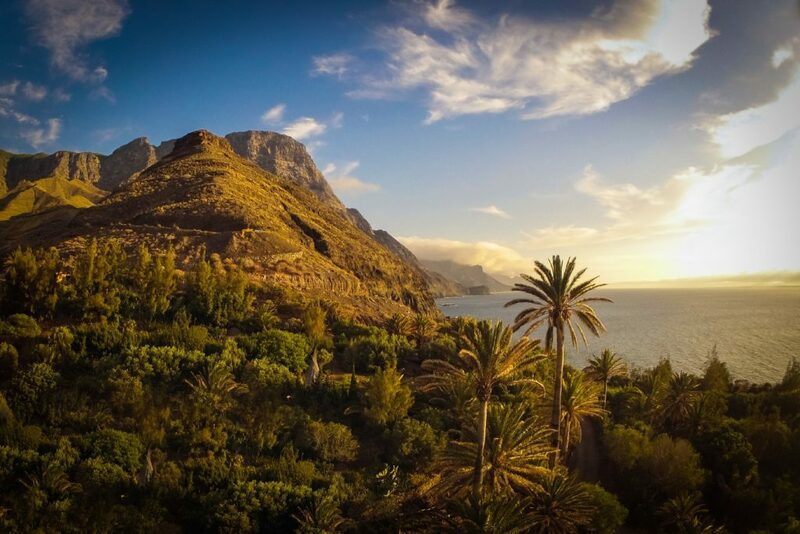 If you therefore like warm, sunny days year-round, then I’d suggest giving the third largest Canary Island a go. 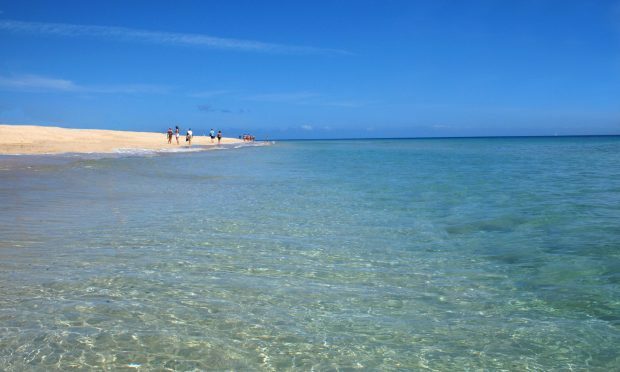 My husband and I weren’t disappointed during our recent visit, when the March sunshine was hot enough to sun-bathe on the island’s many golden and darker volcanic sands, from the sweeping dunes of Maspalomas and lively Playa del Ingles to family-friendly Puerto Rico or classy Puerto Mogan. As there are over 80 beaches to suit everyone including adventurous camel trekking types and families to surfers, gay holiday makers and nudists, I’d just check you’re on one that you’re comfortable with before splashing out on your sunbed. After all, you don’t want to end up with more of a view than you bargained for! A happy family on Maspalomas beach. The island’s capital Las Palmas doesn’t tend to come top of the resorts here, but I have to wonder why as this colourful, cosmopolitan city with its South American vibes boasts no fewer than three beaches: Las Canteras, Las Alcaravaneras and San Cristobal. 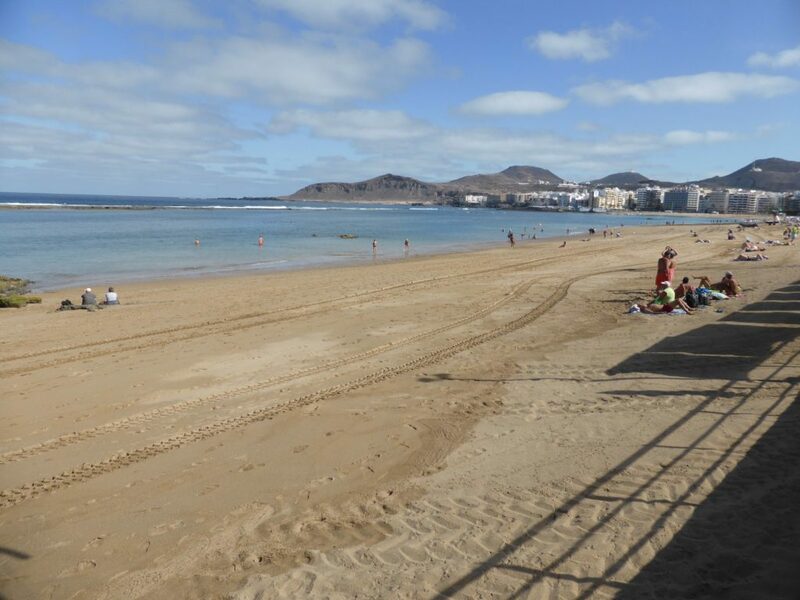 I’d even stick my snorkel out to say that the symbol of the city – Las Canteras – is one of the best urban beaches in Europe. Sheltered by a reef, the sea is calm enough for tiny tots to dip their toes in the bath-like water, while all ages love strolling the wide promenade with ocean-front cafes, music-filled bars, sea-view hotels, ice cream parlours and international restaurants. Local specialities include the delicious Canarian new potatoes with a spicy Mojo sauce, fresh seafood and kid stew (as in baby goat)! ‘Donkey’s Belly’ doesn’t appear on menus but is instead an unusual cloud phenomenon which means that, although renowned for star gazing thanks to clear and unpolluted skies, the north of the island can be cloudier from April to August. Mogan Playa on Gran Canaria. If, heaven forbid, any rare rain should fall during your visit, then rest assured there are still plenty of indoor options. Hot, duty-free bargains are the talk of the town with cut-price deals on jewellery, tobacco, perfume and electronic goods, although EU limits apply (at least for the time being). Souvenirs can be found from markets and shopping malls to craft stalls and boutiques in the rambling, cobbled streets of the oldest district Vegueta, now a UNESCO World Heritage Site, or pedestrianised Triana, surrounded by Art Nouveau buildings. Close to the cruise ship terminal and busy port, the Elder Museum has Scottish roots as Alexander Elder and his brother John were famous 19th century shipping magnates from Glasgow. It looks like a plane may have slipped on the bananas they once transported and skidded into the side of the science museum, but this simulator is just one of the many intriguing hands-on exhibits which include an out-of-this-world space pod. If it gives you a taste for exploration, then you really should beat a path to the lush and mountainous interior of the island with canyons, fruit plantations, forests and exotic flora and fauna. Adventurous activities include jeep safaris, rock climbing, mountain biking and hiking the volcanic Bandama Crater which – you’ll be relieved to hear – last erupted about 3000 years ago. Another explorer – some bloke called Christopher Columbus – also spent time on Gran Canaria during his first voyage to the Americas and the elegant Casa de Colon (where he is said to have stayed in 1492) can still be visited. As one of the quietest destinations in Europe, Scotland is the ideal place to enjoy some R&R. The recent Scotland Visitor Survey commissioned by VisitScotland revealed that almost a quarter of holidaymakers here chose Scotland to get away from it all. See visitscotland.com for ideas of where to find peace, perfect peace, such as Galloway Forest Park and Sandwood Bay. Stay seven nights half-board at the three-star Hotel Ariston in Lake Levico, Italy, from £558 pp (saving £240 pp), based on two sharing. This includes return flights from Edinburgh to Verona and airport transfers departing on May 31, 2017. Visit inghams.co.uk/lakes-mountains-holidays or call 01483 791116. Are You At Risk For This Common Travel Malady?